Listen to "10% Happier: How I Tamed the Voice in My Head, Reduced Stress Without Losing My Edge, and Found a Self-Help That Actually Works--A True Story" on your iOS and Android device. I love Dan, this book, his journey, everything! So glad I read this one!! The book kept my attention and gave me a look at different self help options other than reading. Loved this book. It was not what I was expecting, but so eloquently written with such humor, authenticity and passion. I love that Dan narrated it himself. It didn't feel like a self help book, it was just a guy, telling a very good story. And if you haven't tried the app of the same name, you are truly missing out!! Gives amazing and simplified ways to change your life. I have read other self-help books without completely understanding those other authors, and ultimately, those books did not help me. Ironically, Dan Harris read the same books and had similar results. However, Dan Harris did more research and gives insight into those other books that breaks down what to learn from each of those authors. Dan Harris holds nothing back on his opinions of others and his complete honesty is both helpful and humorous. Entertaining. Sometimes I zone out with audiobooks but this one kept me actively listening and laughing. I am, like Harris, a very down-to-earth, action-oriented person. For me, this was perfect and extremely realistic. This book housed such an engaging story about the author's path toward becoming a more mindful person. I've read plenty of books about meditation and mindfulness but none have actually inspired me to take action the way this no nonsense book has. I absolutely loved Harris' unabashed honesty and self-effacing authenticity. This is such a distinctive perspective on mindfulness yet one I think most people will be able to relate to. I hope Harris keeps writing! Excellent read. Funny, inspiring and real. 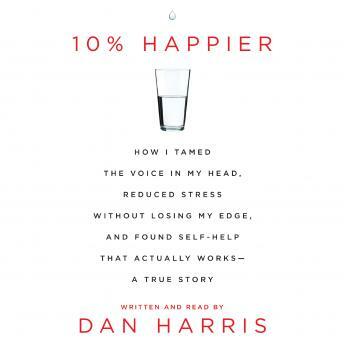 Dan Harris found a way to keep me listening despite my skeptical nature.